Managed Service Providers (MSPs) are speaking up about how cloud directory services are changing the way they do business. JumpCloud® is helping open the door to a new frontier of operational efficiency and enhanced security for MSPs and their client organizations alike. The impact of JumpCloud for MSPs ranges from streamlining technical processes, such as remote client management, to big picture improvements like tighter cloud security, better margins, and increased flexibility. Recently, we were fortunate enough to sit down with Brett Ramberg, Boulder-based Altitude Integrations’s CEO and owner, as well as Jan Kalkus, Altitude Integration’s Lead Technician, and ask them a few questions regarding how leveraging JumpCloud is influencing business for themselves and their clients. As a cloud-forward IT service provider just starting to scale JumpCloud’s Directory-as-a-Service, Brett and Jan had plenty to talk about. Let’s take a look at how MSPs like Altitude Integrations are turning a corner towards the cloud, and changing their business model for the better. As the owner and CEO of Altitude Integrations, Brett Ramberg has to make sure his clients are completely satisfied, while also keeping an eye on the bottom line. In this business-oriented 5 minute video, Brett breaks down why organizations looking to scale are the ideal customer profile for Altitude Integrations, and how JumpCloud is helping their team meet the rising tide of demand for cloud-based identity management and resources. 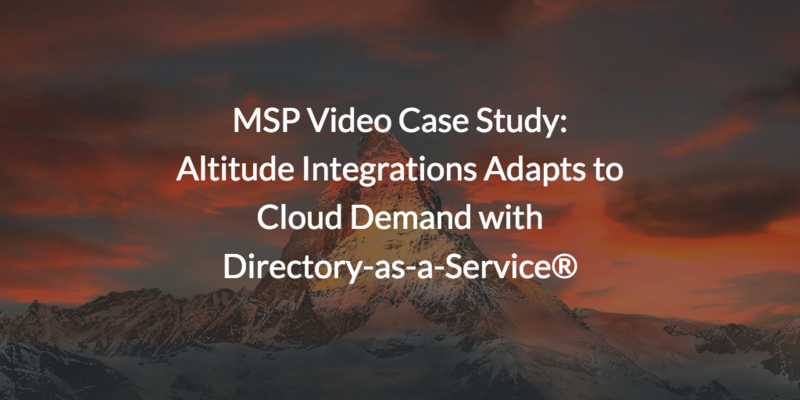 Brett outlines where the MSP industry is coming from in terms of the break/fix model, and details the benefits of leveraging JumpCloud for their client organizations as well as the Altitude Integrations team. By saving time, money, and operational redundancy, Brett sees JumpCloud’s use for their team only continuing to rise as they look to bring on more clients than ever before. Jan Kalkus is an experienced technician who has implemented JumpCloud and experienced the process and results firsthand. In this technically focused 5 minute video, Jan explores the value of JumpCloud’s platform from his perspective as the Lead Technician of Altitude Integrations. From the integration with productivity suites like G Suite™ and Office 365 to expansive scaling capabilities for global organizations, Jan explains how JumpCloud went above and beyond their requirements as a cloud-forward MSP. One highlight is that Jan and the team at Altitude Integrations no longer have to go on-site to address client requests. This greater operational efficiency means more time and opportunities. Managed Service Providers must be ready and on-call for practically any IT request under the sun. From password changes to onboarding a new employee, from integrating entirely new cloud-based applications to offboarding an entirely distraught employee, MSPs can have dozens (literally, dozens) of client organizations to manage. What’s more, each client comes packaged with their own combination of users, systems, protocols, platforms, and providers. For admins working for MSPs in particular, JumpCloud’s ability to seamlessly connect users to the resources they need while giving admins full visibility over the entire process means more time to focus on other things, like projects and security. With the cloud backing their cross-organizational operations and cutting down on friction for off-prem management, MSPs can service more clients with fewer people. Access many more case studies or watch another case study video to see how JumpCloud is being leveraged across various organizations and industries. By providing competitive margins and referral payouts, the JumpCloud Partner Program enables MSPs to benefit directly from our growing partner ecosystem. Ongoing technical and implementation support is provided along with opportunities for marketing and sales trainings as well as JumpCloud-sourced service opportunities. Watch the intro video above and apply to be an official JumpCloud Partner today. Want to see the platform in action? Live weekly Partner webinars are available every Wednesday and a recording is sent to all who register.